The University of New Mexico and the Department of the Air Force as represented by the Air Force Research Laboratory, Directed Energy and Space Vehicles Directorates, today signed an Educational Partnership Agreement. The agreement's objective is to facilitate collaborative research opportunities between AFRL and UNM, two research intensive Albuquerque-based organizations, to improve career opportunities for UNM students, advance technological development in the state of New Mexico and expand STEM education research initiatives throughout the New Mexico educational system. The agreement was signed by UNM President David J. Schmidly, David A Hardy, director of the AFRL Directed Energy Directorate and Col. William T. Cooley, director of the AFRL Space Vehicles Directorate. Schmidly said, "The agreement is a wonderful opportunity for UNM to work more extensively with a premier research laboratory that has great strategic importance to the state's economy. The chance for our students to work closely with professionals engaged in cutting-edge research will give them an extraordinary experience." Schmidly is an internationally respected researcher and scientific author. As a noted scientific naturalist, he has authored nine natural history and conservation books about mammals and more than 100 scientific articles. Hardy, a member of the Senior Executive Service, is director of the Directed Energy Directorate, at AFRL, Kirtland Air Force Base. Hardy leads the Air Force's center of expertise for directed energy technology, developing and transitioning research technologies into military systems. The directorate provides pervasive, world-class directed energy and imaging research technologies for users across the Air Force and the Department of Defense. Hardy manages numerous state-of-the-art research laboratories and testing structures at Kirtland AFB, and several unique facilities which include the Starfire Optical Range at Kirtland AFB; a testing site at the U.S. Army's White Sands Missile Range, N.M; and the Air Force Maui Optical and Supercomputing Site in Hawaii. Colonel William T. "Bill" Cooley is the commander, Phillips Research Site and Materiel Wing Director, Space Vehicles Directorate, AFRL, Kirtland Air Force Base. He leads a team of 941 military, civilian, and on-site contractors who comprise the nation's Center of Excellence for military space science and technology, research and development, as well as advanced technologies integration and demonstration. The Battlespace Environment division of the Space Vehicles Directorate is moving more than 150 positions from Hanscom Air Force Base to Kirtland Air Force Base this year. A ribbon cutting ceremony for the new Battlespace Environment Laboratory that will house the division was held this week. Cooley said, "The strong relationship between academia and the Battlespace Division (formerly the Geophysics Lab) has been one of their keys for success over the past 50 years while located in the Boston area. Now, with the move to Kirtland, establishing a robust relationship with UNM will ensure the world-class research and space science they are known for will continue into the next 50-years. I expect the entire directorate will benefit from the relationship with UNM!" UNM and AFRL already collaborate in some areas, including the Configurable Space Microsystems Innovations & Applications Center (COSMIAC) where students from UNM and other universities work with faculty to design and build small satellites that can be launched into space using technologies such as Space Plug and Play Architecture. NASA has already selected UNM to build a satellite named Trailblazer to be launched in early 2012. UNM faculty members who will work as a liaison between the two institutions are Christos Christodoulou from Electrical and Computer Engineering, Gregory Taylor and Harjit S. Ahluwalia from Physics and Astronomy, Mahmoud Reda Taja from Civil Engineering and Sul Kassicieh from the Anderson School of Business. 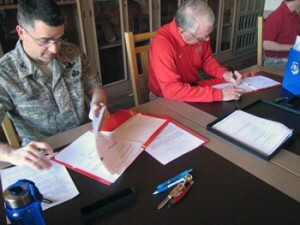 The agreement allows the AFRL to loan or surplus laboratory equipment to UNM, to make laboratory personnel available to teach science courses or assist in the development of science courses, to involve faculty and students in defense laboratory research projects and to cooperate with UNM in developing a program under which students may be given academic credit for work on defense laboratory research projects. The agreement also allows the laboratory to provide academic assistance and career advice to UNM students.